“My family is SO pleased with our pool you completed for us this year. Actually the entire backyard has been transformed into an oasis for us. I cannot state strongly enough how much we appreciate the work you and your crews did to make this transformation happen. From the very first meeting to discuss the initial ‘wish’ list and design, we were made to feel that our dreams were your dreams for us as well. Through every step of the process our comfort levels were always foremost in your minds. You and your crews always checked to see how we thought and felt about the design, process, progress, materials, and timing or the entire project. Even with the fact that ‘mother nature’ was not always on our side when it came to schedule, you and your crews still came through in completing right on the promised time-frames. It was amazing the care that every crew that came to our home took special care to make sure they left only top-quality results. The materials are all top of the line. Even with the sub-contractors we hired to do complimentary projects, your crews made sure that the work was seamless. To Frank and Lisa; thank you for making it seem so easy for us to add a pool to our backyard. I don’t think we could have chosen anyone better to take care of us. Even now almost two months from completion, I know we could call you with any issues and it would be addressed with the same concern as if it were your own issue. This past summer Pool Tek installed a new water-featured entry sign here at Palm Beach Towers. Their workmanship and professionalism was outstanding! The job was completed in a timely fashion, and on budget. The new sign has generated a real positive buzz in our community ever since its installation. “Hey Frank. Thanks for the pictures. Your work looks amazing as always. I also wanted to take this chance to thank you for the stellar job you did on my pool. It turned out exactly as I had hoped. Maybe even better! The pool has completely transformed my property and is my oasis when I come home. I especially appreciated your service through the process including late night calls while Ii was traveling in Hong Kong. 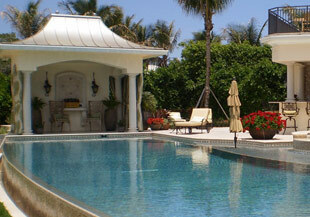 Your continued service after the pool was completed has been amazing as well. All in all, I truly couldn't be happier and would gladly recommend you to anyone. “When we needed to make a decision regarding which pool contractor we would choose to build a spa and waterfall at our home, we relied on our years of experience in the industry. As owners of the major leak detection company in the area, we knew some companies not to use. Also, as active participants in the Florida Pool & Spa Association, we knew the best.